On 25 March, Ilse Marschalek and Maria Schrammel from ZSI, on behalf of SMART-map, took part in the European Citizen Science Forum, organised by the CRI Paris – Center for Research and Interdisciplinarity and Tekiu Ltd, as part of the EU’s DITOs (Doing It Together Science) project. Marschalek and Schrammel joined the European Stakeholder Round Table on Citizen Science & DIY Bio, focused on helping to build the relationships between institutions and citizen science communities. It was an inspiring meeting with multiple stakeholders and interesting discussions on ethics, RRI and motivations of the public to get engaged. 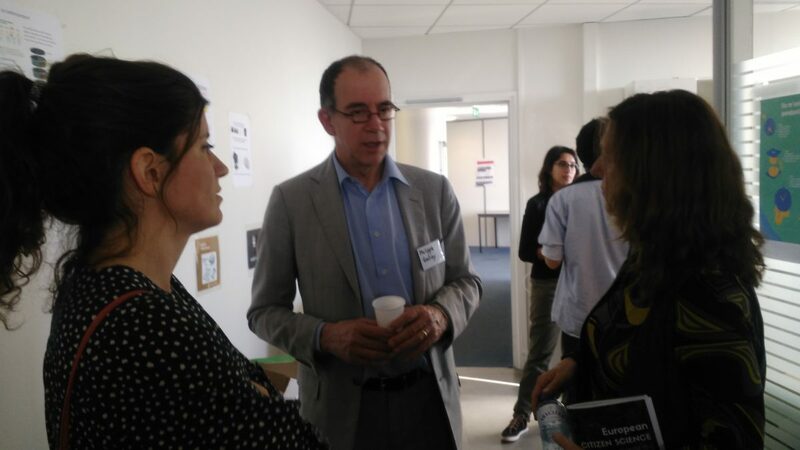 The event has been also an occasion to meet Philippe Galiay, Head of Sector ‘Mainstreaming Responsible Research and Innovation in Horizon 2020 and the European Research Area’ in the Unit RTD-B7 ‘Science with and for Society’ of DG Research and Innovation (European Commission). SMART-map contributed to the “Voices of Citizen Science & DIY Bio” video, a collection of contributions from the citizen science community put together from the CRI team and projected at the start of the forum.